Wednesday 16 Col. Hill and Lt. Hoover started out again this morning to look for a camp for our regiment. The heat is very oppressive. I did considerable writing today. Feel very well. 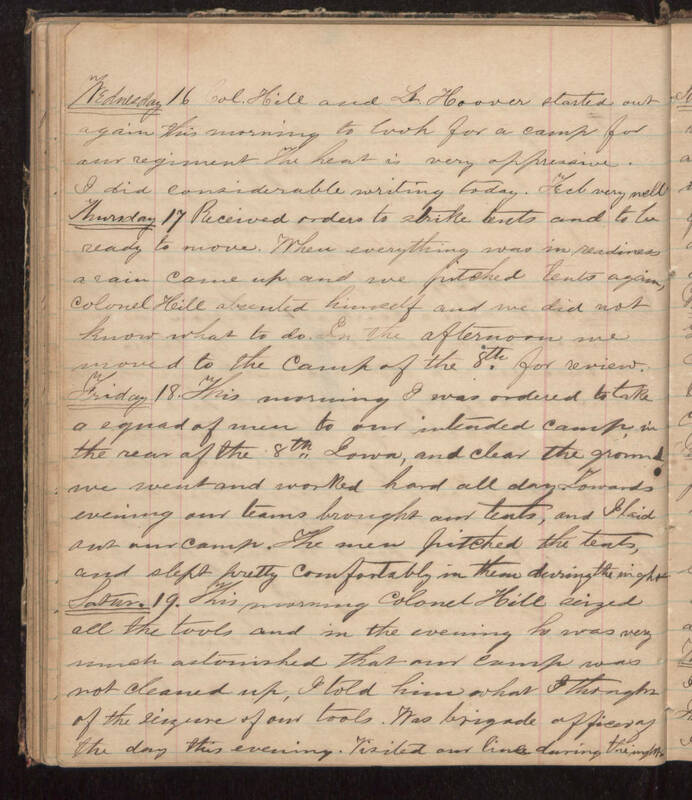 Thursday 17 Received orders to strike tents and to be ready to move. When everything was in readiness a rain came up and we pitched tents again, Colonel Hill absented himself and we did not know what to do. In the afternoon we moved to the camp of the 8th for review. Friday 18. This morning I was ordered to take a squad of men to our intended camp, in the rear of the 8th Iowa, and clear the ground, we went and worked hard all day. Towards evening our teams brought our tents, and I laid out our camp. The men pitched the tents, and slept pretty comfortably in them during the night. Saturday 19. This morning Colonel Hill seized all the tools and in the evening he was very much astonished that our camp was not cleaned up. I told him what I thought of the seizure of our tools. Was brigade officer of the day this evening. Visited our line during the night.